What does it take to make the perfect cup? 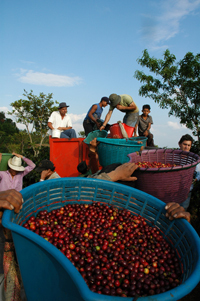 Coffee cherries being loaded onto a truck (Herbazu, Costa Rica), photograph by D. Major Cohen. 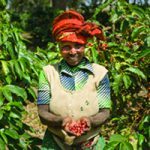 Woman holding cherries (Tanzania), photograph by Mark Stell, courtesy of Portland Roasting. Coffee: The World in Your Cup presents the story of one of the world’s most widely traded commodities and how it has affected cultures, economies, and environments across the globe. Coffee explores the environmental and social impacts of the coffee industry and recommends ways for consumers to make socially and environmentally responsible coffee purchases at the grocery store or in a coffee shop. Learn about the impacts of caffeine, the world’s most commonly-used drug, on your body, discover coffee’s early controversial reputation as a “revolutionary drink,” and consider the culture that surrounds coffee in the twenty-first century. Photos, maps, text, selected artifacts, and audiovisual presentations help visitors explore the fascinating world behind the coffee we drink. To find out more about coffee tastings, coffee talks and other events associated with Coffee visit www.parkcityhistory.org/events. Coffee is a new touring exhibit, organized by the Burke Museum of Natural History and Culture in Seattle, and generously supported locally by Jim & Zibby Tozer, Hal Compton, the George S. and Dolores Dore’ Eccles Foundation, Java Cow and Linda McReynolds. Coffee plants use caffeine as a natural pesticide to paralyze and kill destructive insects. Fortunately, it doesn't affect humans in the same way! In 17th-century London, coffeehouses were called "penny universities" because for the price of a cup of coffee, you could listen for hours to enlightening talk. Since the 1960s, when new varieties of sun-tolerant coffee were developed, scientists have noted an alarming decline in migratory birds. Well managed shade-grown coffee farms provide the forest canopy environment, upon which many species of migratory birds rely for survival. Visit the Library to see their display of books about coffee and learn more about its complex history.